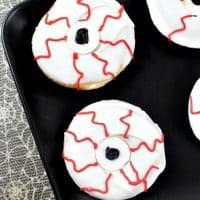 Bloodshot monster eyeball doughnuts make the perfect creepy Halloween dessert! Just mix, bake, and decorate and this spooky treat will be ready in no time! Monsters go hand in hand with Halloween. 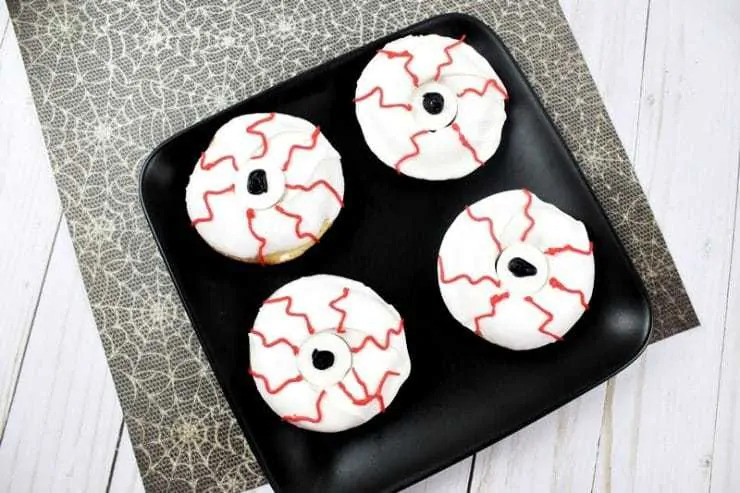 That is why these creepy bloodshot monster eyeball doughnuts make the perfect treat to serve at your Halloween party. Your guests are sure to get a kick out of them. Plus, they will love the doughnuts' rich and delicious icing. The best part is that these donuts are so super easy to make. No frying necessary. Start with a boxed mix and just prepare as directed on the box, pop in the oven, and these spooky treats will be ready to decorate before you know it. 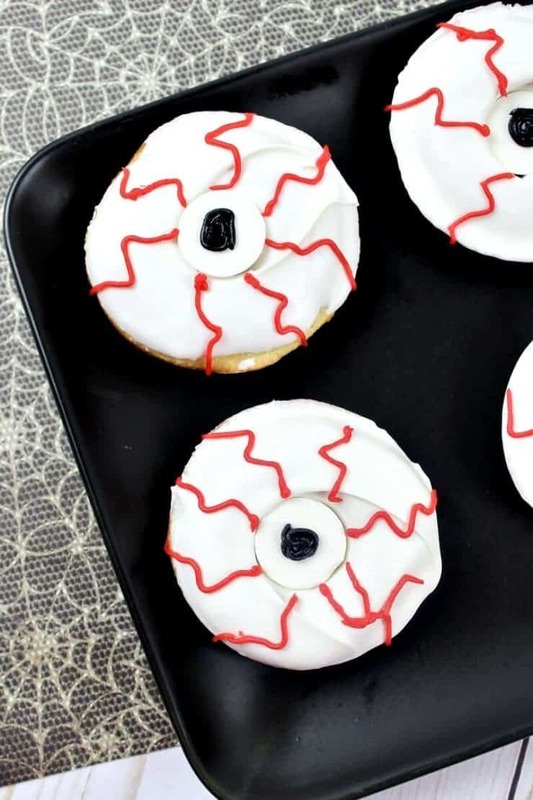 The key to making these eyeball doughnuts really is to have all the right supplies. 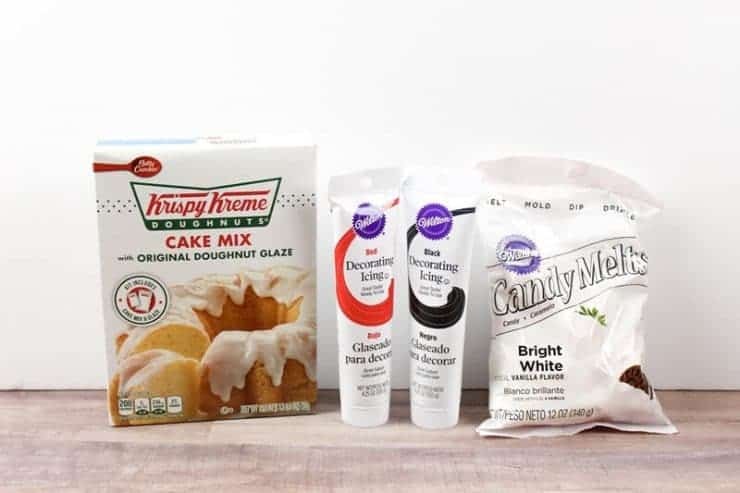 Be sure to pick up a doughnut pan, piping bags and a no. 2 round tip. Links to purchase the products on Amazon are included below for your convenience. Preheat oven to 350 degrees. Then, mix cake mix, water, vegetable oil and eggs according to the instructions on the cake mix box. 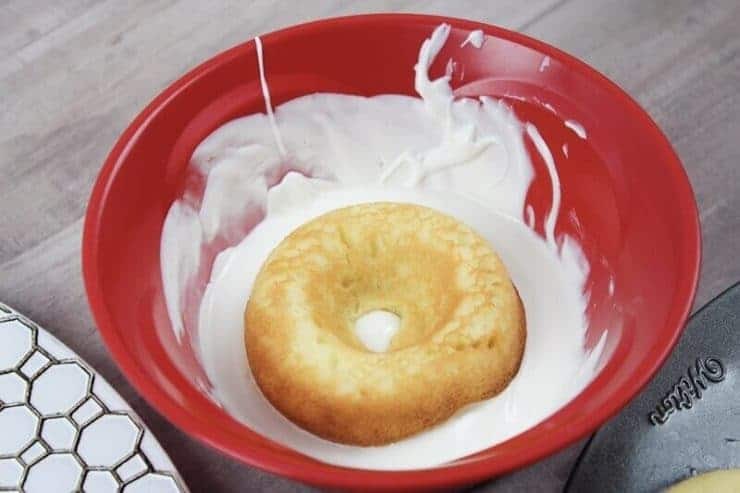 Spray doughnut pan with cooking spray. Pour doughnut mix into a measuring cup for easy pouring. Pour the doughnut mix into the pan, making sure not to fill all the way to the top. Bake in oven for 12 minutes. Remove pan from oven and allow to cool for 5 minutes. Melt white candy melts in the microwave or with Wilton Melting Pot. Dip the top of each doughnut into the white candy melts and then place on a plate. Let harden for 5 minutes. Using a no. 2 round tip draw 5-6 squiggly lines (aka veins) on each doughnut using red icing. Then, using black icing, draw a dot on the center of each candy melt. All set! 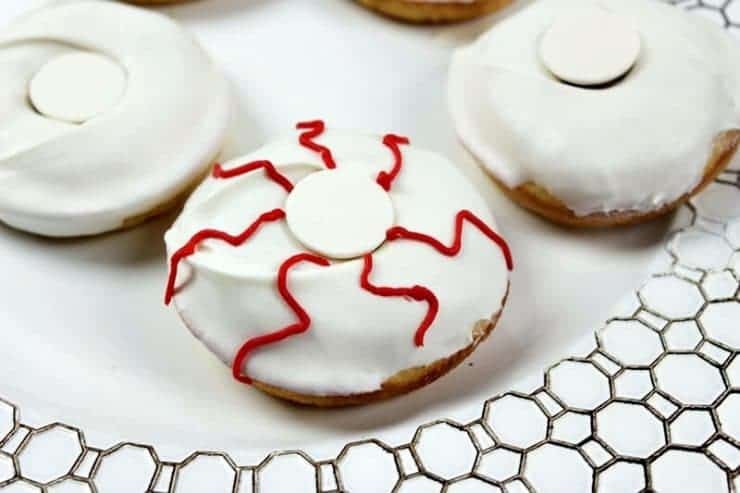 Your Bloodshot Monster Eyeball Doughnuts are ready to enjoy! I hope you enjoyed this recipe and that you and your family have a very happy Halloween! Mix cake mix, water, vegetable oil and eggs according to the instructions on the cake mix box. 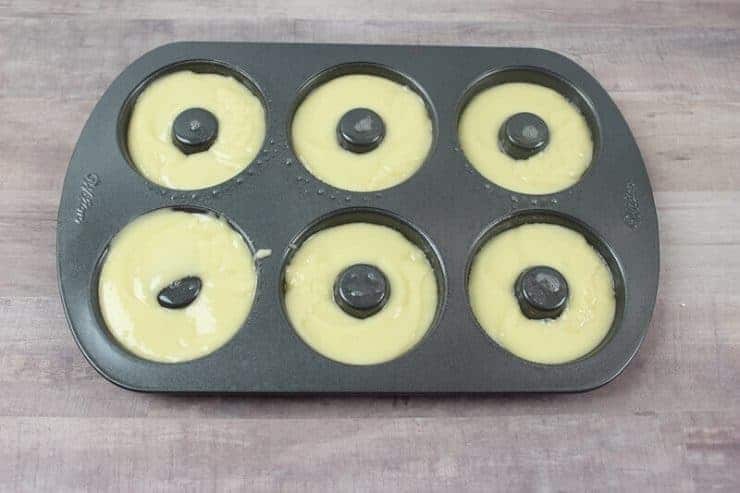 Spray doughnut pan with cooking spray. Pour doughnut mix into a measuring cup for easy pouring. Pour the doughnut mix into the pan, making sure not to fill all the way to the top. Remove pan from oven and allow to cool for 5 minutes. Melt white candy melts in the microwave or with Wilton Melting Pot. 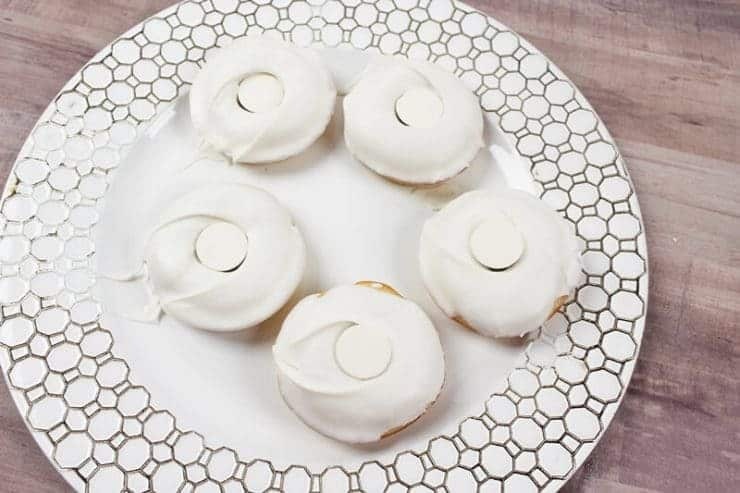 Dip the top of each doughnut into the white candy melts and then place on a plate. Let harden for 5 minutes. Use a no. 2 round tip to draw 5-6 squiggly lines (aka veins) on each doughnut using red icing. Draw a dot on the center of each candy melt using a no. 2 tip and black icing. These are perfect! My guys would love them! My daughter would seriously love these. Hard to beat a doughnut, and the design is truly perfect for Halloween. Too good to eat! Incredible! I cant wait to get started on this. My family can be hard to impress, but I have a feeling this dessert will be met with amazement! Thank you for sharing this! It looks absolutely incredible! I cant wait to try it.